Occupy the Music Scene - Support from Occupy Wall St. The live music industry is in a rough place: performing musicians are expected to advertise their own shows and bring in a large fan base, but most of the money from ticket sales goes to lights, sound and the venue before anything goes to the band. So to make up for that, many musicians work day jobs, which takes away from their ability to craft great music and perfect their performances. Both musicians and their fans suffer in this endless cycle, as more artists give up on music due to the high costs. 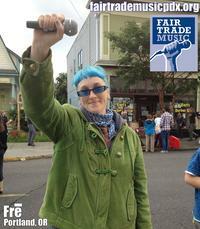 Luckily, Fair Trade Music – a grassroots campaign of Portland, Oregon, musicians supported by the Musician’s Union Local 99 – has a solution. Through advocacy, education and recognition, they are working to “build a better music scene with a higher level of musicianship and professionalism, extend the same rights to musicians as those of other workers, and to forge equal partnerships between clubs and musicians.” By focusing on rewarding positive solutions, Fair Trade Music is helping build strong, honest relationships between venues and musicians. They strive to show venues that, for the long term, investing in great music and taking some of the financial burden off of musicians will also benefit the venues and entertain their patrons. By helping clubs thrive, musicians will also start to thrive, and quality music will be possible once again.